In 2018, the Canadian Touring Car Championship (CTCC) was in its twelfth year. The championship is being contested over six race weekends at four different tracks in Ontario and Quebec. 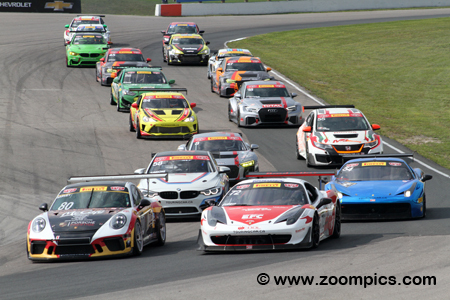 The series opens in May on the Victoria Day Weekend at Canadian Tire Motorsport Park (CTMP). Following CTMP, teams will compete at Calabogie Motorsports Park, Shannonville Motorsport Park and Trois-Rivieres. The final two race weekends would see the championship return to CTMP and Circuit ICAR. In the offseason, series management announced a new class which is called, GT Cup. This new category includes exotic and high-performance machines such as the Chevrolet Corvette, Dodge Viper, Ferrari 430/458, Nissan GTR and Porsche 991/997 GT3. Touring - This is intended to be an entry-level category. Vehicles competing in this class are allowed minimal performance enhancements. Manufacturers represented in this group include the – Mini Cooper S, Honda Civic Si, Acura RSX and Mazda RX-8. Super Touring - Super Touring includes many of the same makes and models found in Touring. However, this category allows engine modifications and aerodynamic body enhancements. Additional manufacturers competing in this group include the Porsche Cayman GT4 and BMW M235iR. GT Sport - The Ford Mustang is the most popular vehicle racing in this category. However, this class also includes cars such as the Toyota GT86, Audi RS3 LMS TCR and Honda Civic TCR. Like Super Touring, some changes and modifications are permitted. GT Cup - This new GT Cup class will be comprised of ultra-performance race cars. Vehicles in this category are typically powered by six or eight-cylinder engines. Of the four groups, these cars produce the most horsepower. 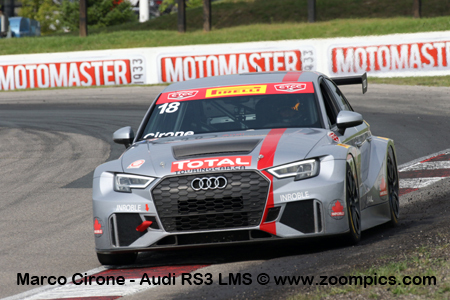 The Canadian Touring Car Championship made their second visit to Canadian Tire Motorsport Park in late-August for rounds nine and ten - the penultimate weekend for the 2018 season. Drivers would be competing in two forty minute races around the ten-turn 2.459-mile road course. The start of the weekend’s final event and competitors enter Canadian Tire Motorsport Park’s corner ten in anticipation of a start. On the pole is the Porsche GT3 Cup of Friday’s winner, Martin Harvey. Sharing the front row with Harvey is Mario Guerin in a Ferrari 458. A total of seventeen drivers (GT Cup – four, GT Sport – nine, Super Touring – two, Touring - two) competed in race ten. 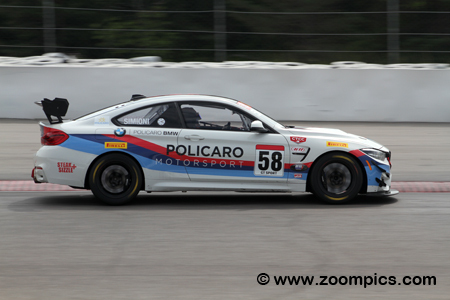 GT Cup competitor, Mario Guerin was victorious in rounds five and six at Shannonville Motorsport Park. Driving the No. 72 Ferrari 458, Guerin topped the timesheet in the opening practice session. Unfortunately for him, he was only second fastest in qualifying. During the first race, Guerin chased the pole-sitter, Martin Harvey and claimed the runner-up spot. On Saturday, the order was reversed and he took the win. Malcolm Strachan has been absent from the racing scene for a number of years but demonstrated he hasn’t lost his touch. 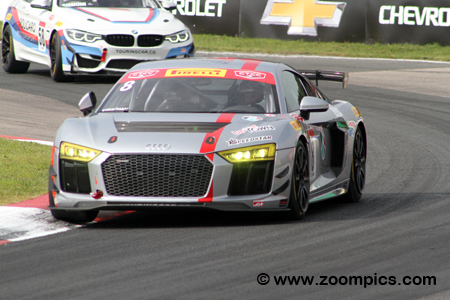 Strachan debuted a new Audi R8 GT4 LMS at Trois-Rivieres and swept the GT Sport division. At Canadian Tire Motorsport Part, he was second fastest overall in practice. Unfortunately, in race nine, Strachan had issues and finished last. On Saturday, he was back on form and won by a 10.929-second margin. In eight starts, Marc Raymond has recorded seven Super Touring class victories. Unfortunately, this category has been undersubscribed and Raymond is often the only entry in the class. In rounds nine and ten, there was a second entry – Scott Giannou in a Blanchet Motorsports prepared Toyota 86. 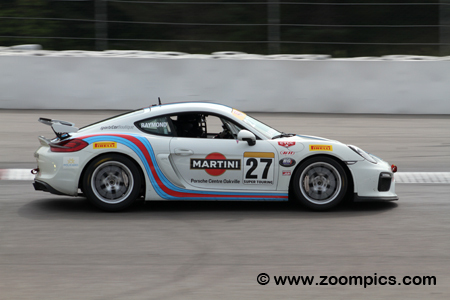 Raymond dominated both the weekend’s races in the Policaro Motorsport Porsche Cayman GT. 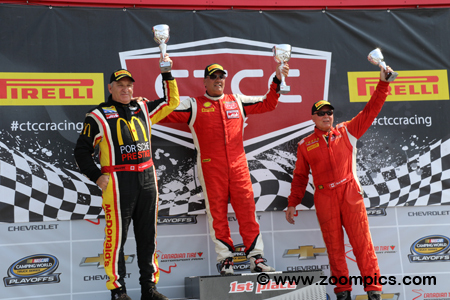 The round ten GT Sport podium at Canadian Tire Motorsport Park. On the right is third-place finisher from M&S Racing, Tom Kwok. To the right is the runner-up and Saturday’s winner, Ethan Simioni. Between these two competitors is the class winner, Malcolm Strachan the driver of the Speedstar Motorsport Audi R8 GT4 LMS. IMSA Ultra 94 Porsche GT3 Cup Challenge competitor, Martin Harvey used the weekend to make his first start in the Canadian Touring Car series. The driver of the Wingho Racing Porsche GT3 Cup grabbed the pole for Friday’s race by 0.719-seconds and led round nine flag-to-flag. The following day, Mario Guerin jumped into the lead and while attempting to mount a challenge, Harvey spun and finished a distant second. Newcomer and GT Sport championship leader, Ethan Simioni drove the No. 58 Policaro Motorsport BMW M4 GT4. 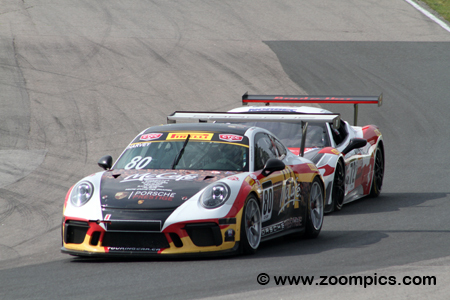 The rookie’s season started with a victory in round two at Canadian Tire Motorsport Park. For the weekend’s first contest, Simioni qualified first in class and captured his second win of 2018. The following day, he was unable to match the pace of Malcolm Strachan and claimed the runner-up position. Another new driver enjoying a great deal of success is Paul Joakim. 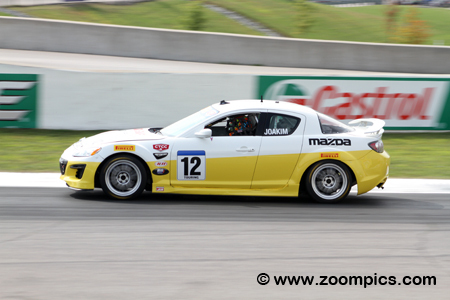 Joakim drives the Can-Saf Motorsports prepared Mazda RX-8. He entered the penultimate race weekend second in the Touring category points chase after victories at Canadian Tire Motorsport Park (CTMP) and Shannonville. 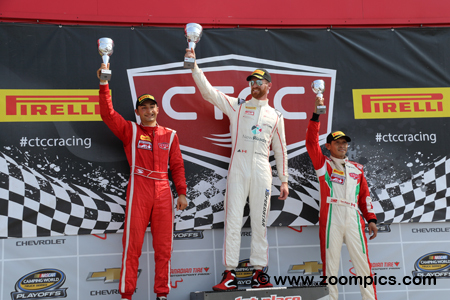 Joakim’s second first visit to CTMP proved to be very rewarding as he won both rounds by a comfortable margin. In the Canadian Touring Car series, the name Alain Lauziere has been synonymous with Team Octane and Mini Coopers. At the Chevrolet Silverado 250 weekend, he and his teammate, Nelson Chan were entered in a pair of Audi RS3 LMS TCRs. Lauziere was gridded tenth overall and sixth in GT Sport for the weekend’s first contest but, he managed to finish third in class. On Saturday, Lauziere was sixth in the GT Sport category. Tom and Gary Kwok were the first team to enter a car in the Canadian Touring Car series constructed for the international touring car class – TCR. 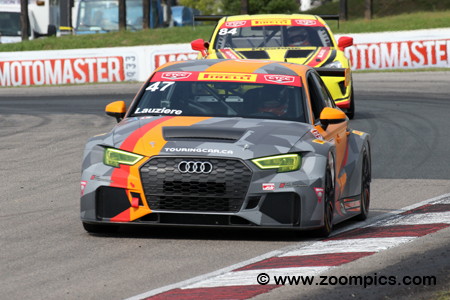 At the Canadian Tire Motorsport Park weekend, there were five of these TCR entries. Tom drove the No. 55 Honda Civic Type-R TCR and on Friday, he finished second in GT Sport. On Sunday, Tom claimed a third place after a terrific battle with his brother and Ethan Simioni. Round ten’s Grand Touring Cup class podium. The category winner, Mario Guerin tops the podium. 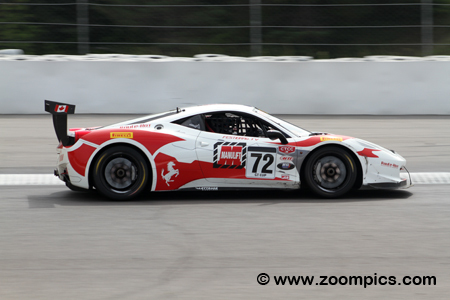 To date, the driver of the Automobiles Etcetera Ferrari 458 had two victories at Shannonville Motorsport Park. To the right of Guerin is runner-up, Martin Harvey using this event to make his first appearance in the series. Completing the podium is the third-place finisher, Rob Metka.